It’s a kind of magic, a special trick: you pick a location for your event, and then we provide the stage, instantly giving it focus and transforming it into a venue. Attached to trucks, our stages can be taken just about anywhere, and once dressed, they provide an easy, attractive and practical answer for events from music festivals to school fairs. We have two of these high-tech outdoor mobile stages, one larger, one smaller, to suit different purposes. ‘Sam’ and ‘Gulliver’, as they’re affectionately known, come with our experienced personnel, who see to their installation, management and transportation, so that the entertainment proceeds without a hitch. This specialised equipment is a complete pleasure to use. 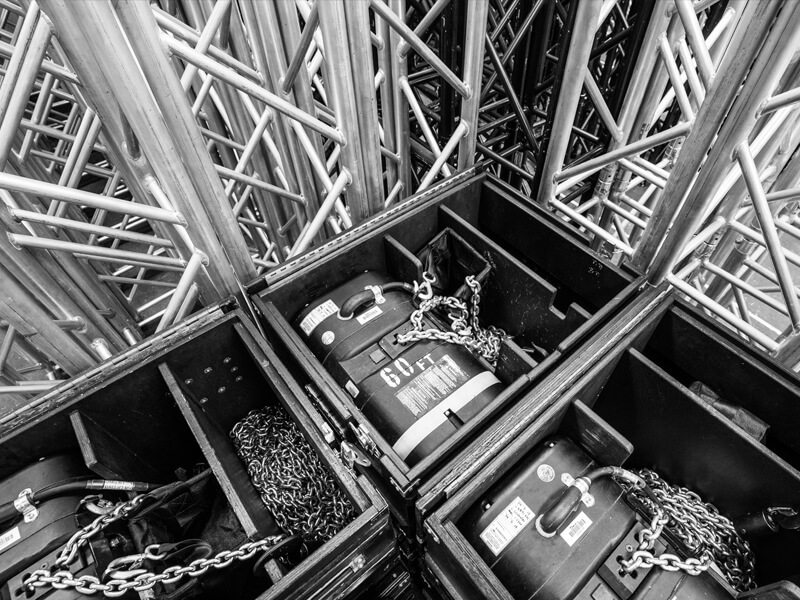 Staging also has several hundred modular staging sections, along with a huge variety of legs, wheels, steps, skirts and the like, so we can custom- build you virtually any combination of staging and risers. We have over 100 CM Lodestar chain motors and a multitude of 300mm, 400mm, and 500mm trussing systems.